A corker from Deanston, the distillery that used to be a wool mill. This whisky is refreshingly simple in its approach. 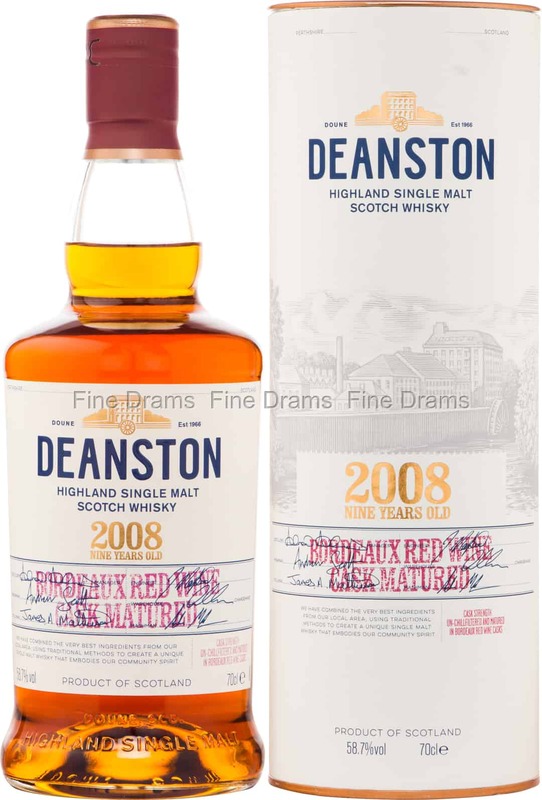 Deanston have bottled a whisky distilled in 2008 and aged for 9 years in former Bordeaux Red Wine casks. The result is a beautifully fruity and sweet Highland whisky. Drinkers can expect flavours of red apple, strawberries, grapes, plums, dark chocolate, espresso, oak, pot-pourri, red wine, citrus peel and dried fruits. The whisky is bottled at a cask strength of 58.7% ABV, and without chill filtration. This bottling is a rare thing in the whisky world: a powerful, delicious and approachable dram.